Arborists spend a lot of time rigging loads down, but sometimes it's necessary to lift a limb or load. With these mechanical advantage system, you can generate a serious mechanical advantage in your favor, multiplying the force the user puts into the system. These kits can be used to lift fallen limbs, tension a speedline, or induce lean in trees. Some mech advantage kits contain a progress capture device in the upper pulley, or a rope grab or prusik in the system, so that the load won't slip even if you let go of the rope. Aerial Rescue: A primary reason to carry a Set of 4s in your gear kit is for aerial rescue. If you need to bring a climber down from a tree, you may need to lift them off of their system before you can lower them. The Aztek is especially good for rescue, and the Petzl JAG is designed specifically for the task. Petzl's JAG kit is ideal for aerial rescue kits. This haul kit is great for pick-offs, making a releasable anchor, or tensioning a system, thanks to its 4:1 mechanical advantage and excellent efficiency (sheaves with sealed ball bearings). The collapsed kit is very compact, making usage possible even if the distance to the anchor is very short - especially useful for lifting an injured climber if there is very little room to anchor the kit. The JAG system haul kit is quick and easy to deploy: it is ready to use thanks to the flexible cover that prevents any risk of tangling. The haul end is color coded for instant identification. The Jag Pulley and progress-capturing Jag Traxion are also available individually for building your own set of 4s. This compact set of 4s can be stowed anywhere and brought out when you need some additional power. Uses 8mm Sterling cord running on SMC Jigger Rescue Pulleys, with a bound prusik loop for progress capture. 700 lb WLL. Contains 2 x SMC Jigger Rescue Pulleys (one regular and one becket), 1/4 Quick Link, 2 x DMM Phantom Screwgate, 40' Sterling 8mm cord w/ Sewn Eye, 6mm x 12" Bound Loop Prusik. The AZTEK elite system utilizes sewn cord products to create a mechanical advantage system. System contains two AZTEK Omni pulleys, 2 x 6mm sewn ratchets, and 2 Sterling SafeD carabiners. The AZTEK is contained in a compact hip-carry pouch. Creates either a 5:1 mechanical advantage or a 4:1 with a change of direction. Applications include lifting downed limbs, rescue, and more. Four-to-one mechanical advantage system from CMI, with a remote release feature. Kit Contains: Uplift Unit (PUL170), Uplift Pulley (PUL171), 2x SMC crossover triple lock carabiners (CAR146), and 200 or 300' 11mm Sterling HTP. Individual components also available. A double pulley is mated to a remotely triggered retractable brake. When rigged with the matching color coded companion pulley it serves as the core of a simple four-to-one mechanical advantage system. Easy to set up, easy to store and easy to use, the entire system can be pre-rigged and stored for quick deployment. This small set of 4's is perfect for adding MA to a Z-rig for pulling stems over, tensioning a high line, aiding in cabling jobs, pre-tensioning a Port-a-wrap, etc. This kit is based around high quality SMC micro PMP pulleys and Kinetic carabiners, along with 3/8" Sterling HTP this makes for a very efficient compound MA system that is very easy to use in the canopy. Large set of 4's built around SMC 3” prusik minding pulley's and 1/2” Samson stable braid. Generate mechanical advantage with the Advance Tech HX pulley from SMC with built-in progress capture and quick release of the cam (even under tension). This compact system can be used in place of bulkier block and tackle sets due to the high strength of the SMC pulleys and SMC Twist Lock carabiners. A great system for quick mechanical advantage with built-in capture and smooth operation. Contains: SMC Advance Tech pulley, 60' of 7/16" HTP rope, two SMC Twist Lock carabiners, quick link, and SMC Advance Tech Mate Pulley. Color of rope may vary. Double pulley with integrated cam that provides immediate progress capture without the need of prusik loops. Stainless pins retain the rope when a rigged system is packed so that system can be pulled out and used immediately. Manufactured from high quality aluminum and anodized to help prevent corrosion. Ideal for all rescue applications where a small mechanical advantage system is being utilized. Up to 1/2” capacity. 34kN / 7,650lb breaking strength (18 kN / 4,050 lb for the becket). Check out our full Advance Tech Mechanical Advantage Kit. Essential components for a creating a 3:1 Z-Rig or 4:1 Piggy Back with progress capture on 1/2" line. Contains 2 x RockO Auto Lock Carabiners, 2 SMC Micro PMP Pulleys, and 2 Sterling RIT Bound Loop Prusiks. Get more power for your work with this 4 pulley system. Upper block has integrated cam device to hold forward progress of rope. Can be used to help you get the most from your Port-a-Wrap. The mechanical advantage you generate with this set will help lift and lower the heaviest of loads. Replacement parts available. Blocks have 1,000 lb WLL • Works with all 1/2” lines • Generates a 5:1 mechanical advantage. Take the block and tackle kits above and add ArborMaster® Bigfoot rope pre-spliced (Sewn eye splice) to the upper block for a handy mechanical advantage system. Now available with longer rope sections for increased movement capacity in the load. The Tree Pulling Kit is a set of components that can be put together to create a 3:1, 4:1 or 5:1 progress-capturing haul system. This kit is available with 150' of 1/2" HTP or as a hardware only option. Both kits include: RIT 9mm Eye to Eye, RIT 9mm Bound Loop Prusik, (2) Steel AL carabiners, (2) SR PMP2 pulleys, Rope Option (includes items listed above, plus):150' of 1/2 HTP, Rope bag. This kit uses the fiddle blocks above with a Gibbs quick-release rope grab to provide serious lifting power with a secure progress capture. Generates a 5:1 advantage and comes with a built-in progress capturing rope grab. Allows 10-15’ of movement in the load. Contains: 2 fiddle blocks, 50’ of Bigfoot rope, 2 screw locking carabiners, and 1 Gibbs rope grab. Click the picture to see a view of the entire system. This kit uses 2 CMI pulleys with a prusik for a more compact mechanical advantage set. Generates either a 4:1 or a 5:1 mechanical advantage, depending on how it is set up. Does not have a progress capture feature. Allows 10-15’ of movement in the load. Contains: 2 double sheave pulleys, 50’ of Bigfoot rope, 2 screw locking carabiners, 1 screw link, and 1 length of prusik cord. 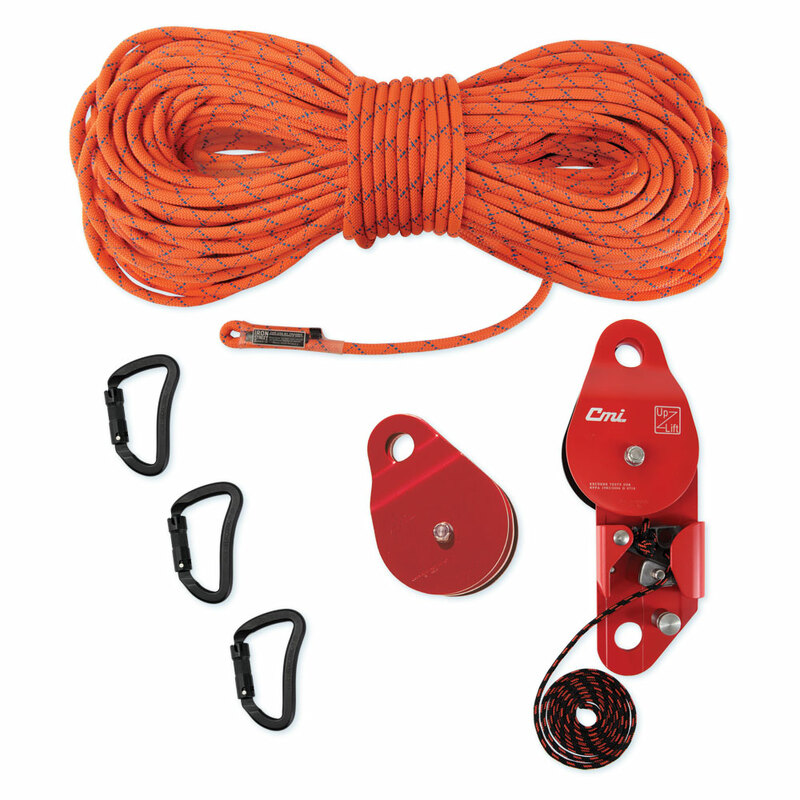 This kit uses 7'16" rope and compact pulleys to be a very portable mechanical advantage kit. Generates either a 4:1 or a 5:1 mechanical advantage, depending on how it is set up. Allows 5-8’ of movement in the load. Contains: 2 double sheave micro pulleys, 25’ of Blaze rope, 2 screw locking carabiners, 1 screw link, and 1 length of prusik cord. Under no circumstances should a cheater bar be used to increase leverage as it may damage the unit, the rope, or severely injure personnel. It is designed to be used by only one individual using one hand only; it shall be removed before any 'shock' load is applied; it shall NOT be used for heavy or dynamic loads as there are other tools available for those applications. It can attach mid-line and can run virtually any length of rope. The MA is approximately 5:1 - no pulleys, no extra rope, minimum weight, minimum friction, quick, easy on-off, works well 'topside', too. The CMI Rope Jack is used to remove slack & stretch for lowering and to lift the tips on light limbs without having to break out the big guns. It is NOT for heavy loads. Cams, even 'untoothed' like a Rescucender and Gibbs, have been shown to shred a rope with high loading. There are much better tools for the heavy work.